There are a number of different pathways to a surgical career. This page provides a simple explanation of some of the most common routes. 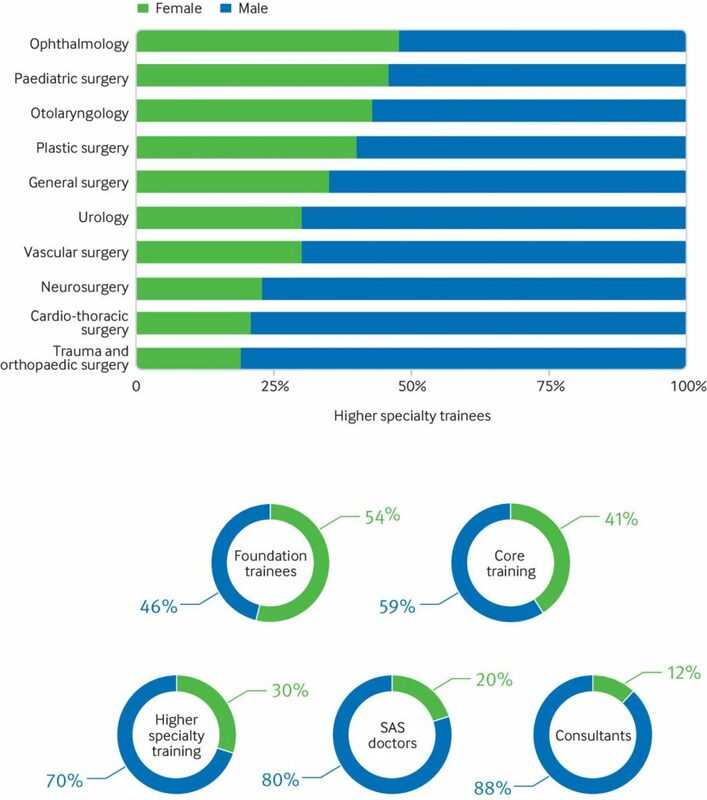 After completing medical school, most UK graduates undertake a 2 year Foundation Program, which rotates through various specialties (both surgical and non-surgical). Following this those that wish to purse a career in surgery have a number of pathways open to them. 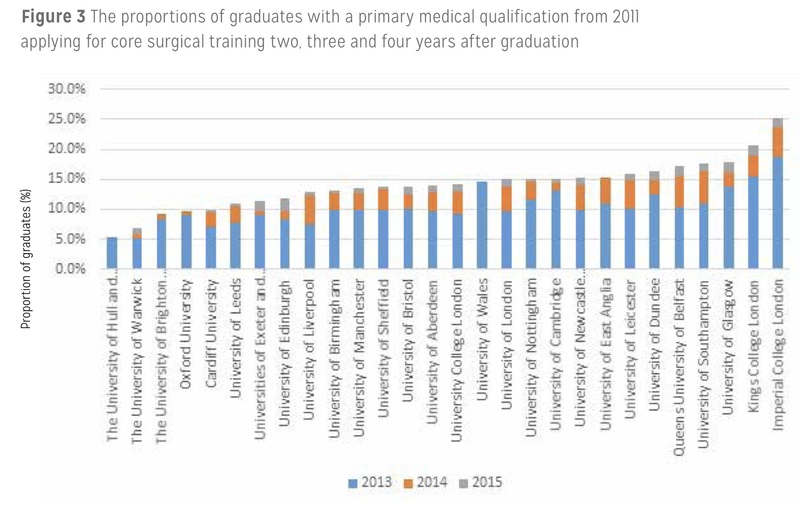 The graph below shows what proportion of graduates from the various UK medical schools go on to apply for Core Surgical Training. The ‘Uncoupled’ Training Route – This involves entering into the Core Surgical Training Program (previously called Basic Surgical Training), and is by far the most common route for surgical trainees. This route involves a national application to a 2 year training program. Each year, a list of available jobs is released, and each candidate ranks their job preferences according to where they want to work and which surgical specialties they would like to rotate through. Applicants that meet the eligibility criteria are invited for an interview, given a score, and ranked against all other applicants in that year group. Jobs are then allocated to candidates, with the highest ranked candidate getting their first choice job and so on down the list of candidates. This continues until all those deemed eligible for a job have been given jobs or until all the posts have been filled. After completing a 2 year Core Surgical Training Post, trainees will subsequently have to apply for an ST3 job in their chosen surgical sub specialty. The ‘Coupled’ or ‘Run-Through’ Training Route – Run-Through jobs are generally less common and historically were only available in certain surgical sub specialties or for those wishing to pursue an academic career. However more are becoming available through schemes such as the Royal College of Surgeons (RCS) Improving Surgical Training (IST) scheme. This is a single application and interview for a job that will continue until the end of your training (i.e. no further competitive selection at ST3/registrar level). Due to their availability and association with academic jobs and research posts, these jobs tend to be the most competitive. The applications for academic run through jobs are normally before the Core Surgical Training application window, and so those that are unsuccessful at getting a Run-Through job can still apply for a CST post. The Non-Training or ‘Trust Grade’ Route – this is a less structured and longer route to take. Jobs are advertised and interviewed for on a local or deanery level and are for stand-alone posts, usually without any annual progression. As a result they are less competitive, but can offer an opportunity to expand skills and experience. Whilst surgical specialities have historically been very male dominated there has been a slow but steady shift over recent years so that now the proportion of women in surgery is 1 in 5. The split between different specialtiies and grades is shown below.